Implementing the right data management and customer interaction strategy has become the focus of CRM across CRM software companies. Companies are striving to create optimal CRM based campaigns. With that said, personalization and customization have a growing importance in driving individual customer experience, reaching the right audience at the right time. However, the CRM sphere is circumscribed by a couple of caveats when it comes to seamless collaboration. To meet these challenges head on, manual mundane task are being fast replaced by personalized workflow automation powered by Artificial Intelligence (AI). AI-powered CRM systems can access unseen and untapped patterns in the system to provide with information and insights for data analysis, lead conversion, trends prediction, and critical decision making. CRM leaders are making the data pool bigger with IoT integration harnessing data from wearables, home devices, phones or cars. In an era where negative feedback no longer reach a call to customer service, optimizing the power of social networks has become a key consideration for reaching out to customers through virtual communities and chatbots. Besides, organizations are on a look out for flexible and accessible CRM platforms that meet the key corporate requirements of ease of integration and multichannel publishing. While an increasing number of CRM software companies already adapting to cloud-powered CRM models, the next frontier for such organizations would be to configure the permutations of private/hybrid clouds and SaaS to fit their business. To top it all, there’s an increased focus on ‘keeping it simple’ and ‘enhanced UX’ to drive seamless user adoption. CRM Companies will face challenges recognizing how to harness CRM to keep their customer relationship healthy. A distinguished panel of CEOs, CIOs, VCs, and analysts, along with CIOReview Magazine’s Editorial Board has shortlisted 20 Most Promising CRM Solution Providers. The listing provides information on how the solutions in this domain work so you can analyze them to choose the best for your business processes. 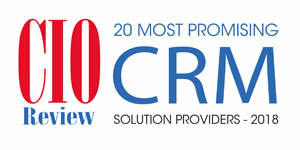 We present to you “20 Most Promising CRM Solution Providers – 2018”.